Like muscles, writing muscles must be exercised as well. And like me and gym memberships gone by, I’ve let my writing muscles waste away. To be completely honest, real life has been quite full on and being creative, at the end of a busy, stressful day, took a back burner. I’ve had a few things to work on (relationships, mental health issues – another blog entry completely, self-development, train delays, yadda, yadda, yadda). Yes, yes! They are excuses. So I thought I’d write. Something. Just to exercise the writing muscles…ease myself into the writing storm that I would like to enter the scene. I’ve been reading a lot of books (both fiction and non-fiction! ), taking online classes (more on these later! ), and I’ve been filling my head with all sorts of ideas. All this in between taking photos and learning how to use my lovely little Olympus EPL-7 properly (yes, still! I am constantly discovering the little tricks this lovely camera can do all with a twist of a knob and a click of a button)and my smart little dynamo GoPro, and working, FULL TIME. Oh I spent a few days in Lovely London! But that is, also, another blog entry! Ha! Yay me with all these writing projects (I have high hopes that they will actually get done!). So let’s call this my excuse for a catching up entry. What’s been going on in your life? Yes, let’s start a conversation. The weekend’s been a bit of a washout. It rained. Really hard. As I was coming out of the hairdressers’ it was, as the Met Office predicted, showery. Very showery. No make that heavy on the showery. But because I was a girl scout (I was, really! I wore the green Girl Scouts of the Philippines uniform for 6 years!) I brought with me an umbrella. Said rain would have, most probably, put a damper on the proceedings at the Colchester Food and Drink Festival. Lower Castle Park can get squelchy when it rains. I was looking forward to going to the food festival today. So the rain wasn’t welcome! Except that I managed to get 2 important things done: my hair AND get dim sum from my favourite Chinese supermarket. I got beef and pork (and shrimp) siu mai, bean curd rolls and dumplings for frying! I was, however, lamenting my choice of footwear. I have allowed my lovely ballet flats (my favourite pair!) to be soaked in rain water. Not a good thing, I don’t think! I may have to replace them. It’s a good thing they’re a Clark’s shoes standard and, thank goodness, there is a sale on! Mind you, that particularly design may not be on sale, but we shall see! On to other things, I am a tiny bit disappointed that my giveaway hasn’t worked. Mind you, I haven’t really done anything to promote the giveaway so that may be the first thing I should address. I will wait until the last day, 6 July and see if there is any interest. If not, I shall go back to the drawing board and have a rethink! Maybe attempt Rafflecopter again? On another note, I am quite surprised at how much I love my hair. It was cut by someone else and I wasn’t quite sure I liked how they handled my hair. Thankfully, it wasn’t something I was unhappy about. What a relief! The lady that cut my hair no longer worked at the salon that I went to. It took me almost 2 years to find someone to do my hair in a way that I was comfortable with. And now she’s moved! I was given her number and I’ve sent her a text message. I hope she sends me a text message back so that I can go where she works! Unless, of course, she doesn’t text back! Scary thought! As promised, I am giving away an iPhone5/5S case. I first thought I’d run the giveaway by Rafflecopter but I need to read up on how it works before I actually use it! The competition is open to anyone and everyone who wants to provide a home to this lovely case (I was quite excited when I saw Claire in Modern Family use a similar case for her phone when I was doing my Modern Family catch up yesterday! At least I thought it was the same case). You have from RIGHT NOW until 1AM British Summer Time on 6 July to enter! The winner will be announced on Sunday, 6 July! On my birthday, I claimed a lovely and very generous goody bag (value of all items combined was over £100 and let me tell you, that bag was HEFTY!) from Carnaby Street and Sister. I have said this before, but thank you again, Carnaby Street and Sister! Mucho appreciated! 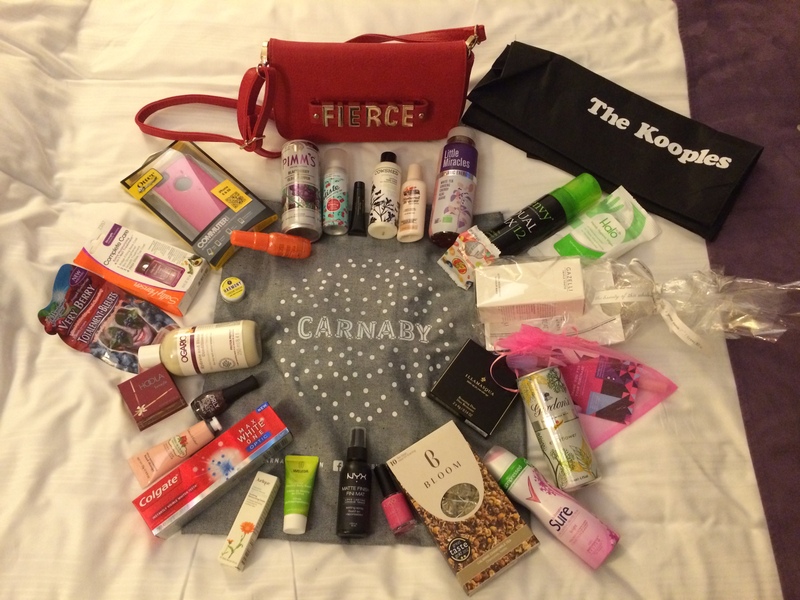 I loved every single item in the perfectly amazing goody bag. Unfortunately, as with all great loot bags, you find yourself unable to use EVERYTHING. One of the fabulous freebies is the now unavailable Avon Pink Otterbox iPhone5 Commuter series case. I am currently using an Incase Slider case (the colour, which is a delicious shade of blue, is called Skydiver Soft! Sounds terribly cool huh? Unlike geeky me, I assure you!) which has proved to be very effective (I am very clumsy with my phone and the Incase Slider case has protected all my iPhones — so far, knock on wood — from the damage that I inflict on it!) so I don’t really have a need for the Otterbox case. It is my intention to run a giveaway on the blog soon to find a worthy home for the phone case. The case has never been used and is still in it’s packaging. 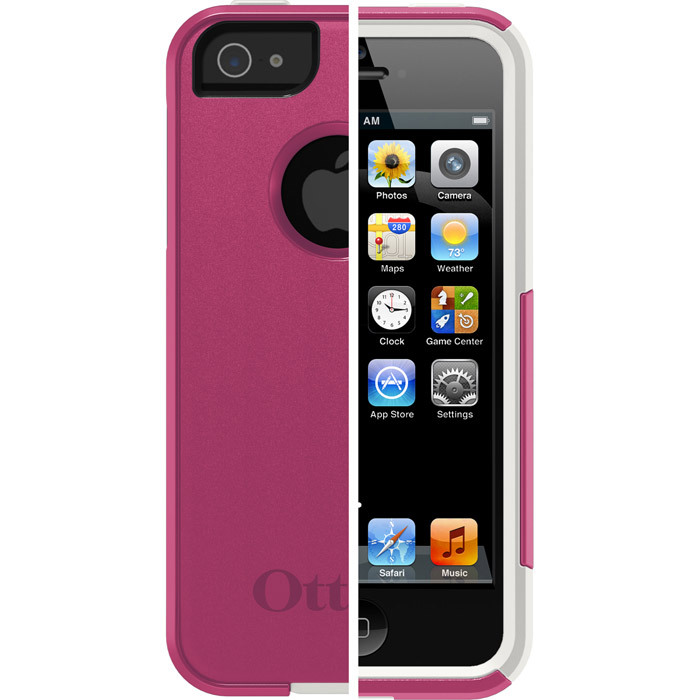 So if you want an Otterbox commuter series iPhone5 case (in Avon Pink!) for your iPhone5 (or iPhone5s) watch this space!